Australia captain Michael Clarke will be one of the pallbearers at the funeral of Phillip Hughes on Wednesday. Hughes died on Thursday aged 25 after being struck on the neck by a ball during a domestic cricket match. The service, held at Hughes's hometown of Macksville, will start at 03:00 GMT (14:00 AEDT) and will be attended by the Australian squad. Cricket Australia (CA) said there was no pressure on players to play in next week's rescheduled Test with India. The four-match series should have begun in Brisbane on Thursday but will now start in Adelaide on 9 December, with Brisbane hosting the second Test on 17 December. Fast bowler Ryan Harris said it would be tough to bowl in Adelaide but added the players were "thinking about" the funeral first and foremost. "In the back of our mind is Tuesday and we have got to do what we can to try to prepare for that," he said. "This is tough for some boys and it is going to be tough for me. I will have to work it out when I get to Adelaide and see how we all feel." CA chief executive James Sutherland said the squad would be given space to come to terms with the death of their team-mate. "It's absolutely up to the individual and any player who is not comfortable or doesn't feel right, or there is medical advice that it is not quite right, we will obviously understand that," he said. Former Australia internationals Mark Taylor, Ricky Ponting, Adam Gilchrist, Steve Waugh and Justin Langer, as well as New Zealand Test legend Sir Richard Hadlee, are among some of the cricketing names attending the funeral and have been asked to create a guard of honour. Screens have been set up at Macksville High School, which Hughes attended, with space for 4,000 people to attend. The local community has also been invited to take part in a public procession that will follow the hearse at the conclusion of the service. 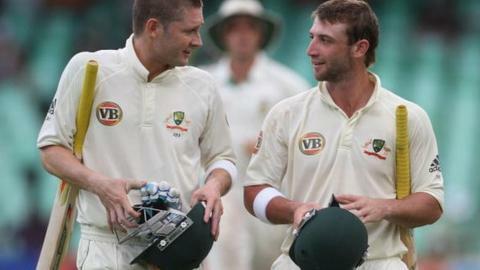 Captain Clarke, who described Hughes as his "brother" in an emotional tribute to the batsman, will also pay tribute to Hughes during the funeral. There will be extensive coverage of the service on the BBC Sport website.